There will be a new update coming soon with some modelling bits, but wanted to add in here a couple of quick plugs for a few shows I will be at in the near future. At each show, I will be hosting a repeating gum tree building clinic, which takes about 20 minutes to run through in the abbreviated version. Clinics will essentially be run roughly every hour throughout the days I'm at these shows, so if you wanted to drop past and listen to a chat about the process I use to create these models, please say you read about it here! 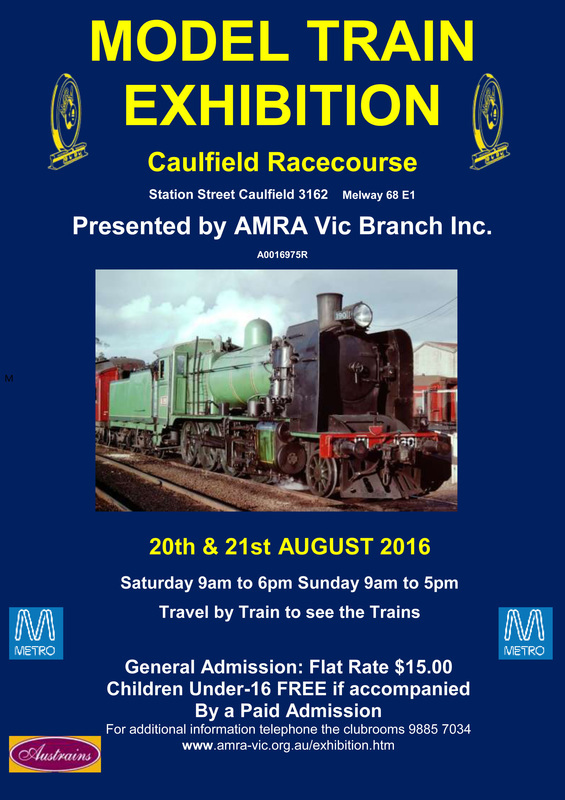 First show coming up is the AMRA Victorian exhibition, being held at Caulfield Racecourse on August 20th-21st. Its probably the biggest model railway exhibition in Victoria, with plenty of traders attending, and usually a good selection of quality layouts up and running across the weekend. It's being held in Albert Hall, which is a pretty cool venue in itself, so will be looking forward to being a part of this one. Check out their Facebook page, as they have regular teaser shots of what is coming to the show. There will be a number of displays travelling over from the mainland, as well as a few brand new layouts being build for this show, so well worth a short holiday down to Tassie for this one. While I have a bit of time to fill in when waiting to get the return ferry home, I want to drop into the Don River Railway in Devonport and have a good browse around (missed the opportunity to do this last time I was down that way). So if anyone is keen to get some more tips on building these big bold trees that dominate our landscape, come for a visit to either of these shows and I'll happily share all the techniques. Of course, while I'm dropping plugs, I can't go without giving the 13th Australian Narrow Gauge Convention a little nudge! Registrations are now available for this event, with plenty of early bird bookings coming in already. There have been plenty of enquiries about local accommodation options (there are some links to suggested places to stay on the website), with a good number of the attendees already booking in to the closest places. There has also been some good interest in the Partners Day Program and the Heritage Railway Tour (being held at The Bellarine Railway), which is great to see plenty of partners travelling to enjoy this weekend as well. Places will be limited o the Partners Day, with spots nearly half filled, so I highly recommend if you are planning to attend this convention with your partner in tow, consider booking this part early. Some of the attending layouts, presenters and traders are starting to be confirmed now, so please remember to check back to the website frequently for updates on what will be happening across that weekend.